The School will be held in room RLAB1 of Palazzo Ricci, Via del Collegio Ricci 10 (see map here below). It is possible to enter Palazzo Ricci also from Via Santa Maria 8. For those planning to arrive at the school by car, it is useful to know that both Via del Collegio Ricci and Via Santa Maria are in the pedestrian area (ZTL- Zona a Traffico Limitato). The closest parking area (accessible to everybody) is in Piazza Francesco Carrara (two minutes walking distance to the School), but keep in mind that usually it is very difficult to find a free parking slot. The recently opened Residence le Benedettine, the guesthouse of the University of Pisa, located on the bank of the river Arno, provides accommodation for both Italian and international students, researchers and professors. On their website it is possible to view the special rates and book the stay. Alternatively you can choose one of the hotels affiliated with the University of Pisa or find a different accommodation. Most of the hotels are at walking distance from the venue of the School. Today, Pisa is crammed full of wonderful, historical monuments and buildings dating back many hundreds of years, and much of the city has managed to retain its medieval appearance. Pisa is also known for its excellent University, which was established in 1343 and has become one of Italy’s top schools. In the north-west of Pisa there is an immense green lawn on which four impressive buildings stand, in gleaming white marble. These imposing structures are the enormous, breathtaking Duomo (cathedral) built almost 1,000 years ago, the Leaning Tower of Pisa, the circular Battistero (Baptistery) – the largest of its kind in the whole of Italy, and the Camposanto – also known as the Holy Field, without doubt one of the most beautiful cemeteries in the world. This area is referred to as the Campo dei Miracoli or the Piazza dei Miracoli (Field of Miracles) and these remarkable Tuscan buildings combine Moorish, Gothic and Romanesque architectural features. The Piazza dei Miracoli is where you will find Pisa’s main tourist information, while additional tourism outlets are located on the Piazza Vittorio Emanuele, and at the nearby Galileo Galilei Airport. Surrounding the Pisa Camposanto on two sides is the city wall, while two major museums are located to the south. These are the Museo dell’Opera – containing a significant collection of sculptures, paintings and other works relating to the ecclesiastical buildings on the Piazza del Duomo; and the Museo delle Sinopie, with many original sketches in plaster from Camposanto frescoes that were damaged by fire in 1944. The Leaning Tower of Pisa isn’t the only edifice that is no longer standing upright in the city. Unsteady, sandy soil beneath the Field of Miracles has resulted in other problems that initially are not quite so obvious. The baptistery lurches noticeably towards the north and also, when viewed at certain angles, the Duomo cathedral is far from straight. There are even a couple of small bell towers (campaniles) in Pisa that have also shifted and these have been nicknamed The Other Leaning Towers: campanile of San Nicola and San Michele degli Scalzi. The historic city centre of Pisa is concentrated on the north bank of the River Arno and is still surrounded by 12th-century walls. The ‘high street’ is the long and curving Via Santa Maria, and connects the Campo dei Miracoli with the Lungarno (Embankment). Palaces and mansions still line this street and retain their splendid facades, which date back to the 16th century. The social centre of Pisa is the Piazza Garibaldi, which is located on the north side of the Ponte di Mezzo (Middle Bridge). Also of note is the elegant Borgo Stretto, which is filled with interesting shops and cafès and the modern Mural of Keith Haring located in the recently restored Vittorio Emanuele square. Last but not least placed in the south side of the river, few steps from Ponte di Mezzo, there is an ancient restored building called Palazzo Blu which is proposed as a modern place for the cultural offer of the city hosting museums and other interesting projects. Finally, we point out the Museo degli Strumenti per il Calcolo (Museum of Computing Machines), which shows an impressive collection of historical computing instruments, including one of the first Italian computers, the CEP – Calcolatrice Elettronica Pisana. Many historic, naturalistic and gastronomic trails can start from Pisa towards the sorroundings. In the following, we mention the closest Tuscany cities that can be easily reached from Pisa. Additionally, Firenze (Florence) and Siena can be also reached from Pisa by train in about one-hour. 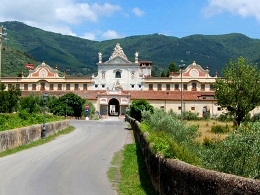 Calci is a few kilometers from Pisa and is located in the the center of Valgraziosa (literally “nice valley”). The valley, which has the appearance of an amphitheater, collects the villages on its slopes. Today Calci is a farming town surrounded by terraced olive groves in the lower part and covered with pine and chestnut in the upper part. It’s a perfect place to have a walk through interesting places from the point of view of nature, environmental, historical and artistic. The most important place to visit is the Certosa di Pisa which is a baroque style monument inhabited by the Carthusian monks with a large courtyard used as point of contact with the outside world. 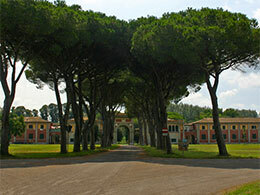 In the complex there are series of buildings, including the Museum of Natural History of the University of Pisa. The village of Calci is about 10 km from Pisa. By bus Calci Pisa can be reached in about 30 minutes by CPT buses. Lucca is famous for its Renaissance-era city walls that have remained intact while so many other Tuscan towns saw theirs destroyed in past centuries. The train station is right outside the southern walls, with an entrance below the balcony of San Colombano that brings you right behind Lucca’s cathedral and into the heart of the small walled town. Most of the attractions in Lucca today show its ancient history: from the trace of the Roman amphiteater that can be seen in the shape of the Piazza dell’Anfiteatro to the archeological remains under the 12th century church of Saints Giovanni and Reparata (the first city cathedral, located just around the corner from the present-day cathedral of San Martino), to the various towers and villas from the 12th to 16th centuries. Extraordinarily, as the city grew and modernized, the walls that surrounded the old town were maintained which was not the case for many other cities in Tuscany. As the walls lost their military importance, the top of the walls became a pedestrian promenade, today one of Lucca’s main attractions. The area around the walls is well taken care of, with green grass and trees everywhere along the walls. They have in essence become a park that surrounds the city and blocks out more modern life. From here, you can enjoy beautiful views over the town and if you’re traveling with children, you’ll also find a few playgrounds where they can spend some time playing. 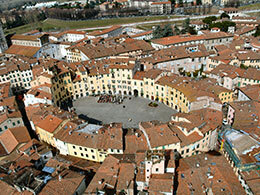 Lucca can be easily reached from Pisa by train in about half an hour. Volterra is one of the finest and lesser known hilltop towns tucked away in the heart of Tuscany only a short distance from Florence 72 kms, Siena 50 kms, Pisa 64 kms, S. Gimignano 29 kms. Idyllically set amidst an evocative landscape of soft rolling hills and lush woodland abruptly defined by barren, deep clay walled chasms gullies and ravines, Volterra, 545 metres above sea level, dominates and divides the Cecina and Era valleys. 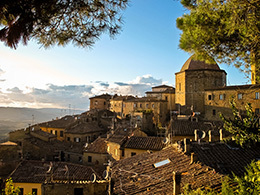 A haven of Etruscan, Roman, Medieval and Rennaissance art and architecture Volterra and its territory are a perfect choice for intensive study programmes or a peaceful relaxing holiday. It is also called the “windy town”, thanks to its hilltop location halfway between the valleys of central Tuscany. A town with Etruscan origins, it became an important Episcopal seat around the 11th century. Nowadays, the town is an important city of art, also well known for the handicrafts of alabaster and onyx. The better way to reach Volterra is by car. It takes about one hour.